Scientists are trying to solve an important problem about how to flip pancakes. Personally I like to eat the pancakes right after they are made so I never have enough to make a stack. Also I never have a problem with burnt pancakes. But it's good to see pancake research going on. Nibs and Lee went to Honey Honey which has sweet and savory crepes. Nibs didn't order a crepe - probably because he couldn't eat a whole one. But when I come to visit me and Lee are gonna go and get some crepes there. I'm not sure what kind of crepe I will get but not the one with all the cheese on it. Very excited! I admit that things have been pretty slow on the pancake front lately. But there is exciting pancake news afoot! Apparently there is a great brunch place in New York where they make pancakes par excellence. Usually great pancake recipes are a closely guarded secret, but somehow Gulliver has found a tome that has the recipe and whatever pancake rituals go along with it. Snuffles is being dispatched post haste to bring back this book, and we shall begin the making of cakes on a pan! Jon Stewart: I'm gonna say waffle. But it also depends on what you're talking about in terms of fillings. I feel that the waffle is... a strong conduit for a fruit-based or a sweet-based addition. It's somehow - in terms of waffle-to-filling ratio - is more robust. That being said, you can't argue with a stackable food, such as the pancake. I will no longer be watching his show. Today is Pancake Day 2015. I'm not really sure how they decide what day is Pancake Day - it seems to move around a lot. It's been awhile since I had a pancake. Today I-Hop gave out free pancakes. I went there one year and had the pancakes. Let me just say, there is a reason they were free. I hold myself to a higher pancake standard nowadays. I prefer to eat top notch pancakes - usually at expensive brunches at hotels where Marilyn Monroe filmed movies. That's just the kind of pancake circles I travel in. Hm, I couldn't really find another thread that seemed appropriate so I'll just turn to this thread to wish a VERY HAPPY BIRTHDAY to DJ and Muffins and the other bears who joined us on May 7!!! As you may already be aware I frequent an establishment called "Chris' Pancakes." I am not sure who Chris is but I do enjoy his pancakes. Well today I got a very special flavor - it was pumpkin pancakes! This is what they call in the restaurant biz a 'seasonal item' and is very rare. My verdict is that it was very tasty with a pleasant pumpkin-y cinnamon-y spice. Also instead of syrup there was a whipped butter that was very nice. I heard from Duddles that he thinks they are potato pancakes but he is an unreliable source. I heard from Peaches who heard from Sneeches that Lee ate some and might also have obtained a secret recipe. Still waiting for confirmation on this. Things are suddenly very exciting on the pancake front. Today was Pancake Day 2017. It is also called Shrove Tuesday - don't ask my why. I heard Lee celebrated by eating a scallion pancake. I don't know what that is but I am very excited Lee participated in this most holy of pancake days. Then a bird and a girl sang the same song in this video although it is not clear to me the bird actually made bacon pancakes. 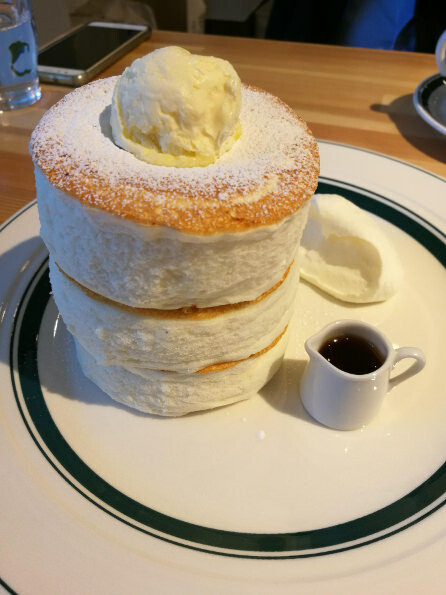 In Japan they make very fluffy pancakes. I personally think these pancakes would make a good seat for me when we watch Nibflix. Sans butter, of course. Mister Patapouf is a furry creature of some sort that has gained notoriety posting on Nibstagram. Now there are several things I should point out here as a certified pancake technician. Number 1, the entire bottom of the plate is covered in syrup. Mister Patapouf is at serious risk of getting syrup on his paws. Most of the syrup should be on the pancake and not the plate people - I can't stress that enough. Number 2, there are banana slices in between the pancakes. Toppings should go ON TOP of the pancakes - hence the name toppings. Rookie mistake there. Besides these two dings, I still encourage Mister Patapouf to continue improving with his pancake practices. Hi, I heard Peaches and Sneeches went out to brunch in Carlsbad and they split some crepes. I commend them on their order - in particular on getting Hollandaise sauce on the side since you never want to commit to an unknown sauce before tasting it first. 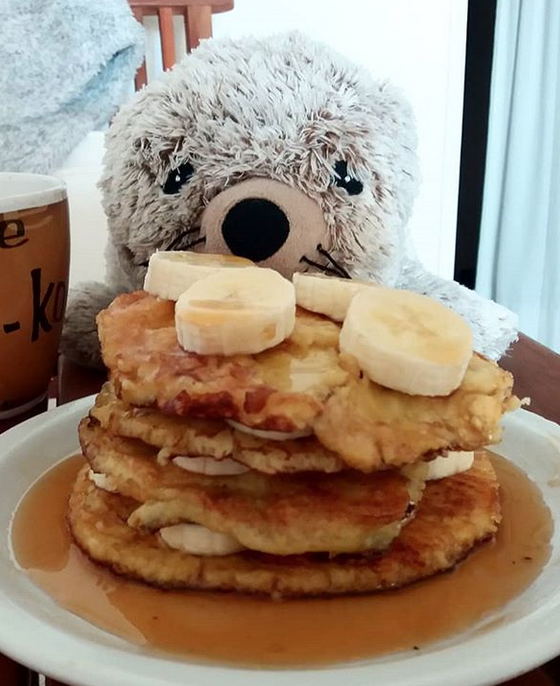 Wishing all you bears a joyous Pancake Day 2019.